Since the great status quo switcheroo following the events of Amazing Spider-Man #700, to my surprise, Avenging Spider-Man has been the Spidey title that seemingly focuses the most on the development and characterization of the brand new Superior Spider-Man. 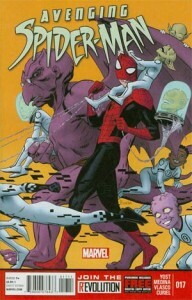 While Dan Slott’s work on Superior seems to focus more on the larger battle for control between Peter Parker and Doc Ock, Chris Yost is really knocking Avenging out of the park story-wise by crafting more nuanced stories that contrast Otto as Spider-Man with his predecessor and with other superheroes/villains within the Marvel Universe. Avenging Spider-Man #17 takes Spider Ock on baby-sitting duty within the Baxter Building, as he’s forced to interact with children and replacement superheroes he deems to be inferior. It leads to an honestly hysterical sequence as Spider Ock internally analyzes each of the four replacement members of the Future Foundation (while looking at Miss Thing, “I have no idea who this is” – me either). Then we get an obligatory “I hate children,” set-up with Doc meeting all the children, including the villainously-inclined Bentley-23 who would ultimate be the catalyst of the conflict in this comic (and naturally, this is the one kid Spider-Ock gravitates towards). I’d also be remiss if I didn’t mention another great comedic line by Yost coming from Dragon Man: “Sadly, my pacifist nature precludes me from babysitting. But beyond the comedic bits, which Yost has been a master of for quite some time (his Spider Island Avengers one shot still remains my favorite issue of all of the arc’s spinoffs), Avenging #17 is doing a great job in showing Spider Ock slowly embracing the Parker mantra of “power and responsibility.” When Time Variance Authority busts in to the Baxter Building to provide a future disaster being caused by Bentley-23, rather than nurturing the child’s evil-side, Doc Ock essentially scares Bentley straight (in Doc Ock mode no less), causing him to reverse course. 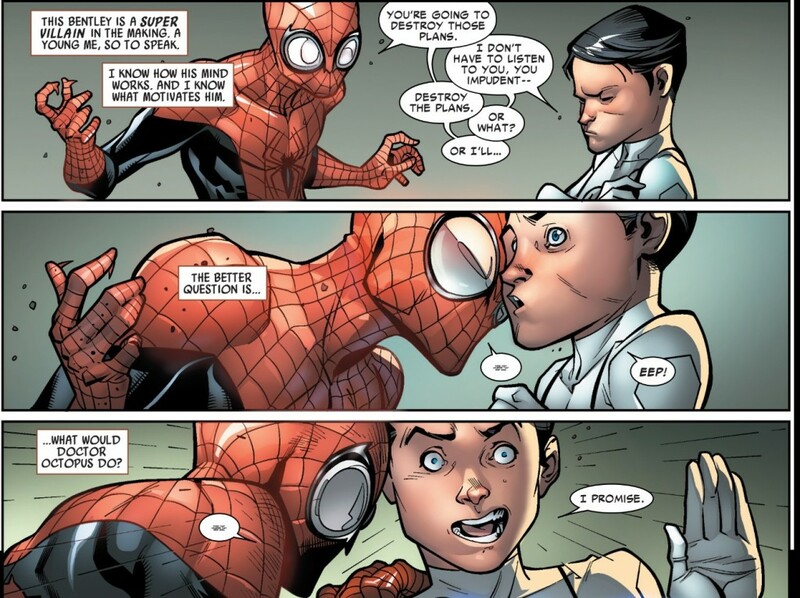 This is important because while Spider Ock saw some similarities between he and Bentley based on how their scientific brilliance can lead to malice, he made a conscious choice to make sure the child used his intellect to aid the cause of good, much like how Otto has essentially been giving a second chance to rewrite his own story by switching minds/bodies with Peter Parker. What makes these plot choices all the more striking from Yost is when I initially read ASM #700 and Avenging Spider-Man #15.1 in tandem with each other, it appeared that Superior and Slott would be focusing on Spider Ock trying to make his life better while Avenging would emphasize the character’s hubris, arrogance and inability to play well with others. Even in Yost’s first full isolated Avenging story, which looked at Spider Ock interacting with the X-Men, it appeared that the villain turned hero was never going to be capable of putting his ego aside and living out the life of a “good guy.” With this issue and Avenging #18 (review to come on Thursday, no thanks to shipping delays for my home subscription) the slow shift away from these conflicts has been prioritized. Since the general concept of the title is a Marvel Team-Up style mash-up, we’re still going to see plenty of Spider Ock butting heads with his caped colleagues, but he at least appears to be learning a bit from these experiences. And, of course we’re still also getting glimpses at Otto’s inherent evil, since he appears to be “collecting” his former Sinister Six colleagues. Overall, I’m still impressed by how Yost has quickly turned Avenging Spider-Man around from a superfluous Spidey-related cash grab for Marvel, into another quality comic book for the franchise. It’s still clearly a “B” series in terms of how its events are portrayed on Marvel’s subjective “importance in the grand scheme of things” scale, but I’m at least enjoying reading these issues and have no qualms writing about them on this blog as a way to better understand the quirks and motivations of the new Spider-Man.